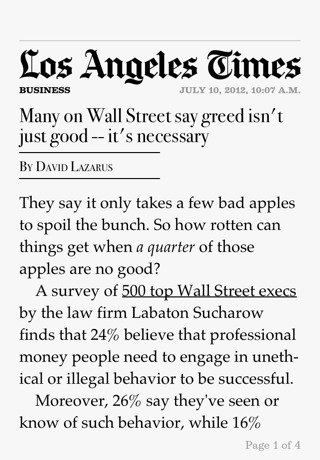 Many on Wall Street say greed is good, or at least necessary. Apparently they watched the Oliver Stone movie Wall Street (1987) and interpreted it as a training tool for how to get rich instead of its intended purpose of revealing what’s wrong with the financial system. In related news, Mitt Romney would like to further deregulate America’s corrupt financial system. So vote for Mittens if you think Wall Street executives deserve less scrutiny.